The battle between getting your books at the campus bookstore or ordering through websites, for student’s money, happens at the start of every semester, but if students want to save a money and not get taken advantage of, online is the way to go. When it comes to textbooks, many come into play, like making sure that you’re getting the best deal and what the resale value on it will be when it’s time to sell them back. For several years, brick and mortar bookstores monopolized the book-buying scene for college students and could charge whatever amount they wanted. 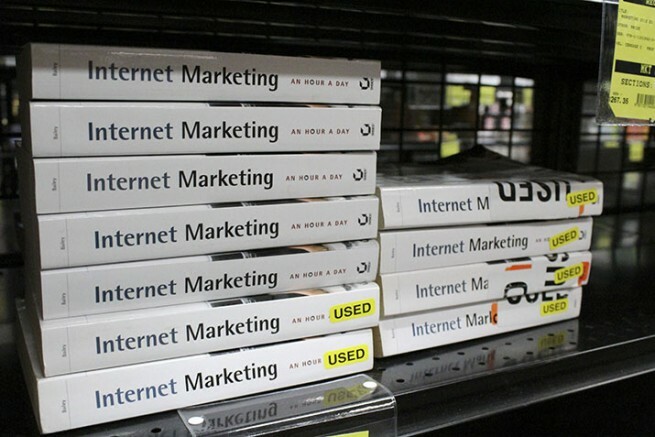 Now that online shopping has become more common and, for some, a more preferred way of purchasing certain items, the door has opened for companies to sell the same textbooks for far lower prices while guaranteeing the consumers that they’re still getting a quality product. In the early stages of online shopping, fear of getting either beat up packages, materials getting lost in the mail or getting ripped off by scammers was prevalent. These issues still do exist to a degree, but now consumers have the ability to track packages step by step and buy the books from secure and well protected websites. Shipping companies, as a result, now have more accountability on themselves, which greatly benefits the consumer. All the options for purchasing books at a store are also available online. While purchasing online, buying a book new or used is always an option, as well as renting. E-books can be rented for as long as the consumers want them and the price will only reflect the amount of time that the book is needed for. Additionally, when students are ready to sell their books back, most websites will show you their buy-back price, making it easier to find out who will give the better deal. Overall, book-buying is now in the hands of the buyer instead of the bookstores, with students having far more options to buy books at the cheapest price possible.